MADhouse Coco-Nutz is MAD Breweries latest homebrew experiment. I loved the Toasted Coconut Brown Ale I had in Hawaii from Kona Brewing Company, and was lamenting that I couldn’t get it in New Jersey. So I spent some time formulating a recipe to try to clone it. What I got was my most delicious homebrew yet. I didn’t quite nail Kona, but nothing is ever going to live up to the memory of drinking fantastic beer at a brewery with your new wife while honeymooning on the big island of Hawai’i, but I did get a tasty nut brown ale with a smooth coconut taste. My coconut was not as strong as I remember from Kona, mixing in with the roasted/coffee flavors of the malt instead of bolding standing out. Next time I’ll probably toast the coconut a little longer, add a little more, and leave it in the wort boil for a little bit longer. I’ll also probably cut back a little on the darker malts, as it may have become a darker brown ale than I was intending despite only being 4.5% ABV. I enjoy MAD Wedtoberfest, but I think this is the first beer that’s truly crossed the line from homebrew curiosity to genuinely tasty beer. I was also pleased to learn that Kona’s beers will start being distributed somewhat nearby in South Jersey. 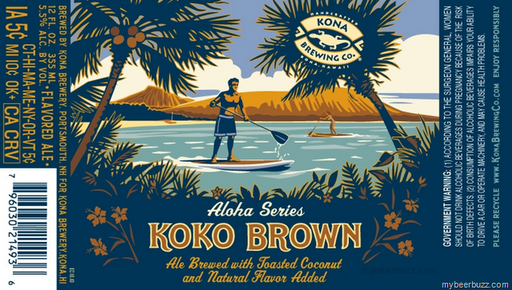 The Koko Brown is part of the Aloha seasonal series, and should hopefully be available to me soon to reminisce with.